Visual Studio Code>Other>SharpPadNew to Visual Studio Code? Get it now. 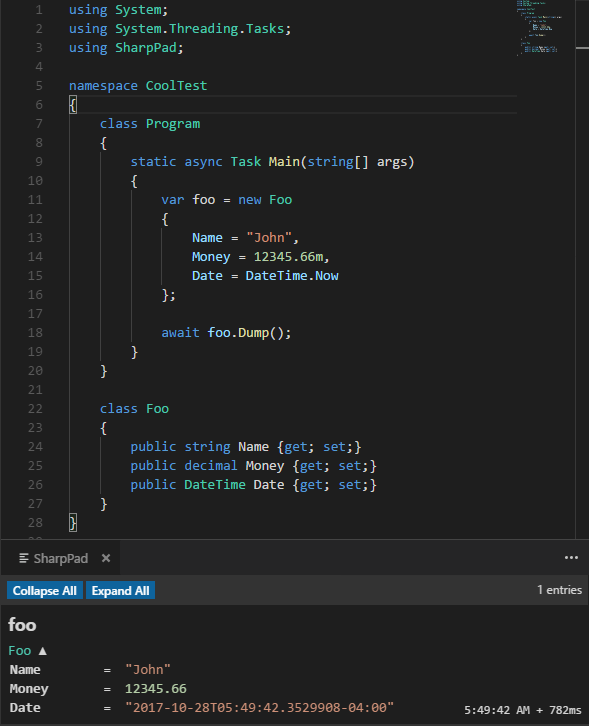 Test snippets of C# code directly from your editor! SharpPad is an extension for Visual Studio Code that allows you easily inspect the results of your code. It works similarly to standalone tools like LinqPad and RoslynPad. Install the extension via the VSCode marketplace, then install the SharpPad package into your project via NuGet. Throw in a using SharpPad; at the start of your class, and Dump() away! *ValueTuple support is limited - named tuple fields only work correctly at the first layer of nesting, and the special DumpTuple method is required for even that. Collections of named tuples are also not supported. You can also dump raw HTML with the DumpHtml method. Useful for specialized output formatting, testing HTML templating, or just embedding gifs. SharpPad runs a listening HTTP server in your editor. When you call Dump() from your code, a request is made to this webserver containing the serialized form of your data. The extension formats this request, and presents it. This means SharpPad requires an open port on your machine - it defaults to 5255, and can be adjusted in VSCode via the sharppad.listenServerPort configuration option, and in your code via the static SharpPad.Output.Port property. SharpPad, by default, uses its own static HttpClient instance and is entirely asynchronous. If you're using the newer versions of Roslyn, you can switch your project to C# 7.1 to take advantage of async Main for smaller/test projects. If you really need a synchronous version, DumpBlocking is available - but not recommended. If you'd like to use SharpPad as an output window for your program without running it through VSCode, use the Show SharpPad command from the Command Palette.